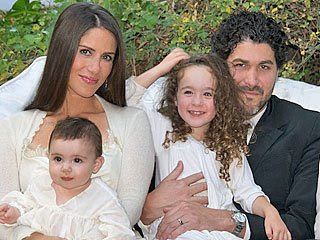 Joined by their daughters Poet, 3, and Jagger, 7 months, Soleil Moon Frye and her husband, producer Jason Goldberg, renewed their vows at their Hollywood Hills home over the weekend. “Besides the days my children were born – and my first wedding – it was the best night of my life,” Frye, who co-owns L.A.’s eco-friendly children’s boutique, The Little Seed, told People. The intimate ceremony, designed by friend Lisa Rowe and held in the couple’s garden at sunset, “was magical,” adds Frye, who wore a gown from Les Habitudes. Amid roses, hydrangeas and gardenias, the couple’s loved ones also enjoyed a “home-cooked feast” including brisket and pasta along with a white cake with chocolate filling. In honor of the occasion, Poet and Jagger planted a pomegranate tree. Friends were also sent home with their own tree to plant.